It is a post-apocalyptic America where primitive survival and brutality is the order of the day. A lone figure travels across the arid land holding the key to restoring man's humanity. It is in the form of a book, one that he protects with his life, and will not hesitate to kill for. But, there are other forces out to get their hands on this valuable asset. One of these being a man running a dusty town with an iron fist. Though bleak and emotionally dark, this futuristic quest tale has a positive tone amid the slow building moments and intense eruptions of violence. Made by the brothers who directed Menace II Society and From Hell. 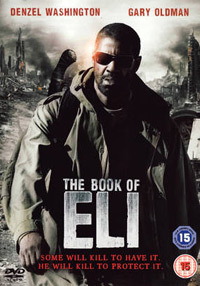 Behind the scenes extra material include a look at how the movie was put together with comic-style storyboards, the post apocalyptic look, and the music.